Dubble Trubble is the first full length release from bass and drum duo Mr Diablo (ex Welfare Heroine ) and Fritz Catlin (ex 23 Skidoo). Their dub reggae and funk fusions occupy a rarefied space, un-quantised and autotune free, expressing all they know with every beat. At the root of their compositions Mr Diablo's bass rolls with a punky bebop-tinged gait whilst Catlin's melodica playing is steeped with the birdsong he enjoys whilst working as a gardener. Influenced by the likes of Can as much as the more obvious dub masters of their youth, the musical intent is to heal as much as to challenge, using the waist winding power of swing like Tai-Chi to ground the listener un-attenuated by the info blizzard of modern life. Truly a fresh ground experience to savour at a time when most cultural output offers only instant but short lived gratification. The cover image of Skintologists’ masterful debut album couldn’t be more appropriate. With its suggestion of a place of residence about to be breeze-blocked byirate builders who later have second thoughts – and stop short of turning the residents home into a premature and yet permanent grave – it’s got that threat of imminent violence familiar to anyone who ever lived in the London, England, borough of Hackney before it got gentrified. Yet, this could also double, or be read, as an act of nature, produced by some unforeseen seismic event. This is where Skintologists come in. With Fritz Catlin, who held down rhythms for avant-garde industrialists 23 Skidoo and the mysterious Mr Diablo, whose bass could be heard in Welfare Heroine and Pinkie Maclure And The Puritans output in the late ‘80s and early ‘90s, we have a rhythm section extraordinaire, who with their many helpers make ‘Dubble Trubble’ a landmark in post-industrial urban dub music. The Do It Yourself aesthetic of the mid ‘80s is filtered through an industrial sensibility until you get an album that’s independent, in the true spirit of the term, and yet pointedly eschews the easy option of wall-to-wall NOISE. Noise here is implicit, not explicit. 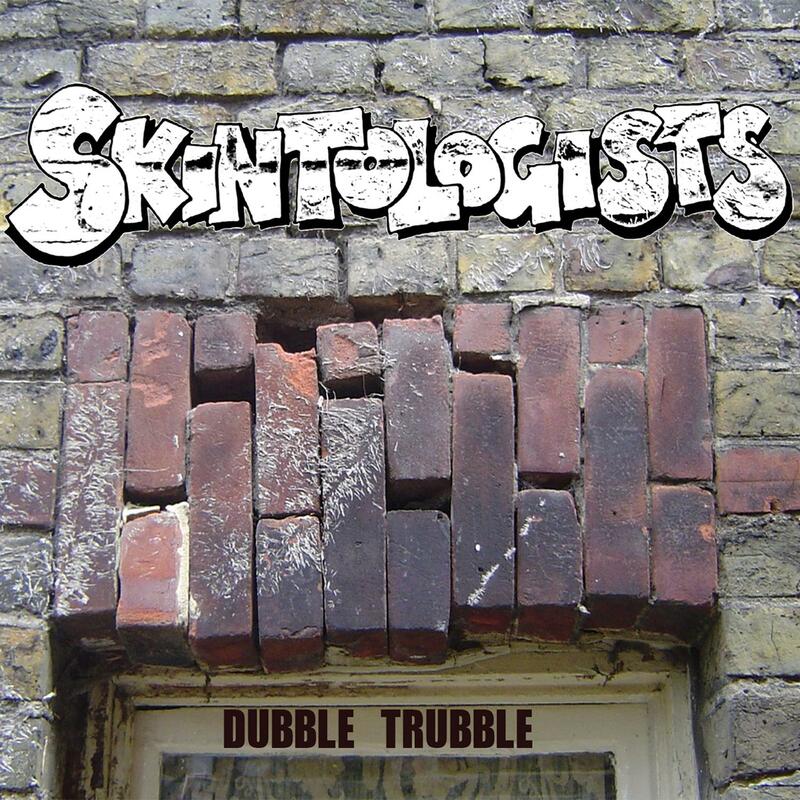 The distinctive, crazy, mutant reggae-funk hybrid that results from a refusal to use loops and samples and an insistence on playing instruments in real time is here simply called ‘Dubble Trubble’.